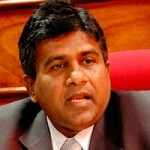 Instead of attempting to take genuine efforts to quell rising ethnic tensions among the Muslims and the Sinhalese in the country, Justice Minister Wijeyadasa Rajapakshe made a statement in Parliament on Friday, which will very likely fuel the anti-Muslim campaign launched by radical Buddhists in the country. On Friday, addressing Parliament, Wijeyadasa announced that 32 Muslims had joined ISIS, however, this appeared to be a very similar number as revealed by Defence Secretary Karunasena Hettiarachchi who told an event in early January this year that 36 Muslims had gone to Syria, some to join ISIS. “The justice minister appears to be attempting to add fuel to the fire, instead of trying to diffuse the tensions. There is nothing new in this number, this was a number already reported on, so why is he repeating an old number?,” a source noted. During his speech, Wijeyadasa alleged that the 32 Muslims who had gone to join ISIS were from 4 families who were well connected and well respected. “There is a serious situation brewing in this country,” he said. He also said that people were coming to the country on tourist visas and going to Muslim schools and trying to brainwash students specially in places like Beruwela and Kalmunai. Wijeyadasa also crticised the Sri Lanka Thowheed Jamath (SLTJ) and its secretary for making statements against Lord Buddha, however, Wijeyadasa made no mention about the increasing anti-Muslim campaigns in the country, including by the Bodu Bala Sena, which threatened to launch a blood bath from Maligawatta mid this week. A Fashion Bug store outlet and large warehouse in Dehiwala have been st on fire last night! A Feashion Bug store was also set on fire during the latter part of MR rule and miscreants were unpunished. Who did it and what action does the government propose to take? There was a protest organized by Gnanasara in Kandy. The slogan (gist) was to burnt down, burn down “No limit” and Burn down “Fashion Bug”. Coincidentally a Fashion Bug was burnt down yesterday. I wonder if there is any correlation? Yahapalana gov or MR gov, All minorites will not be allowed to coexist peacefully. here comes the culprit. you may be one who organised that arson.that may be the reason fashion-bug refusal to produce CCTV information as per latest reports on some web sites. This is the same store that burnt ablaze in 2003. I also can point to rumors and hearsay.There are reports that the guy who had the tapes is in police custody with the tapes. Despite Hon Justice minister announcing in parliament that will ban all the rallies that is associated to extremism, he failed to ban the hate filled rally in Kandy. Come on man, Law should be equal to all irrespective of race or religious status. From Mr. Clean to Mr. Shame. Wijedasa Rajapakse is perhaps one of the most disappointing politicians in recent times. People had so much of hope because of his integrity which now transpires that he never ever had. He is a man with many agendas. Gune, I am one of those who are utterly disappointed with this man. Regret having cast my vote for this wolf in sheep’s clothing. Wijedasa playing Donald Trump to secure his parliamentary seat in the next elections. Some more will follow him soon. Sinhala Buddhist monks attack Muslims again and again. Government turns a deaf ear to these problems. Why are we surprised that Muslims in Srilanka lean towards ISIS. I say Wijedasa, you have delivered just what the doctor ordered. No doubt all what the country needed was a ‘Muslim problem’ now that the ‘Tamil problem’ was well entrenched. You have therefore done much to start up another unnecessary conflagration with an otherwise largely peaceful community. Why not take to yellow robes? With your attitude you’ll make a great hit with Gnanasara and that other clown.